senoretbrothers is a big wall climber from Santiago CHILE. Strong work! So, todos los tres Torres? How long did it take? Looks like you had great weather, congrats! Cristobal is an outstanding climbing talent - he was the Chilean Alpinist of the Year for this ascent, along with tons of other rad climbs. Not only that, but he is a great Big Wall Camper, and was a valued part of our Real Nose ascent team on El Cap this spring. 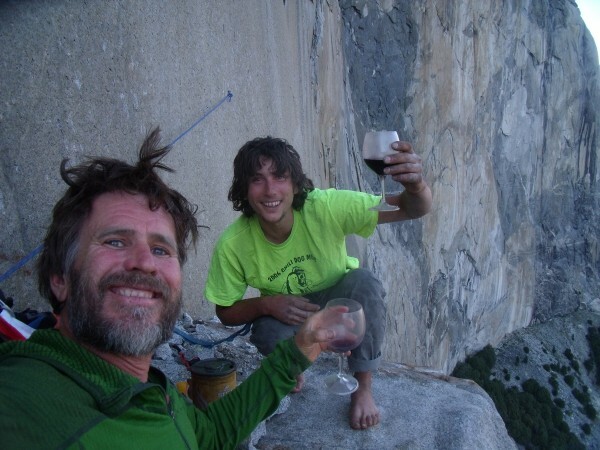 Pete and Cristobal on El Cap Tower while climbing The Real Nose with Heather and Steve Schneider, enjoying some fine Petite Sirah. Vitaliy is right - clean the damn bug off your camera lens, Tola! Impresionante - si quieres escribir algo sobre la ruta en español, hay un público aquí que puede leerlo. Por ejemplo, que significa 'estilo andino'? That's a linguistic nuance I should have previously, but obviously never noticed. Thanks for pointing it out. What a beautiful part of the world. Congratulations! great pics and really cool video. Your weblink doesn't work though. Yeah this is rad. Rad! You cant spell your own website, and you have a bug on your camera lens. Thank you for sharing that beautiful, difficult, wild place! The second photo of the Fortress brought back happy memories as I was a member of the first accent in 1968 a truly beautiful area there was no hotels or any buildings then it was a pristine area Thank you for the memories and well done. From an 81 year old oldtimer. Great job these guys did. Chapeau. One clarification, the word traverse is very ill defined. In 2002 Steve Schneider did a version of a traverse of the three towers in alpine style, solo and at a blistering pace. 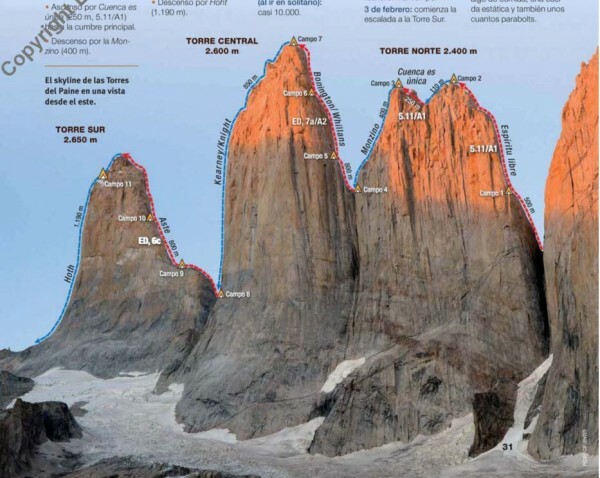 He climbed and descended Torre Norte via the Monzino, climbed Torre Central via the Bonington-Whillans and descended the Kearney-Knight, and then climbed and descended Torre Sur via the Aste. 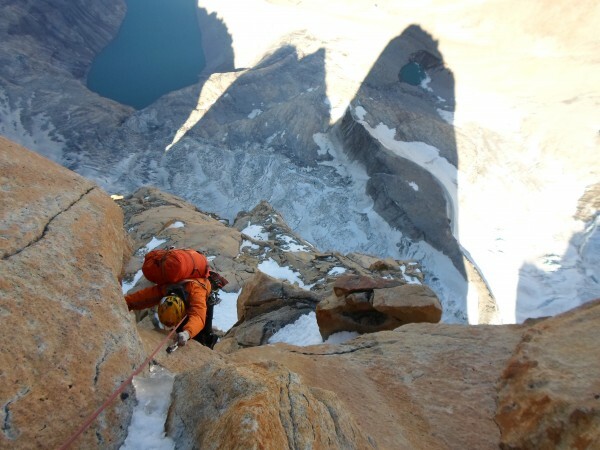 His traverse does not follow the complete skyline but instead climbs a “W,” first accessing the skyline via the col between Torre Norte and Central and then, after climbing Torre Sur, rappelling back down the line of ascent. 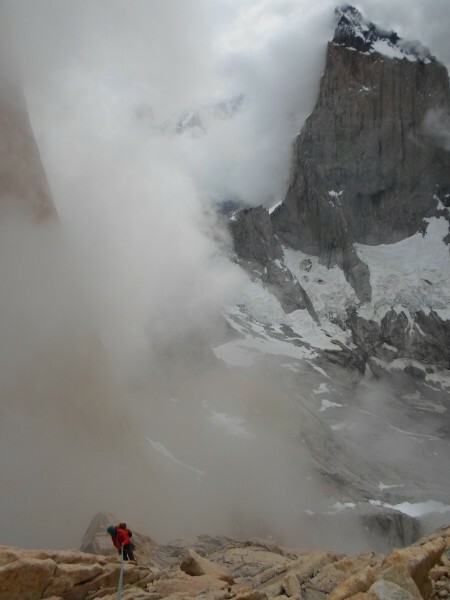 Pedro Cifuentes from Spain was the first to do the "complete skyline traverse" of the towers, starting north of Torre Norte and rappelling south of Torre Sur, in 2013, solo, in 29 days, but with external help (he received a rope and other at his last camp, between Torre Sur y Central). He climbed Torre Norte via Espiritu Libero, then followed Steve's "W traverse" to the summit of Torre Sur, from where, to complete the actual skyline, he descended south via the Hoth Route, a massive scary undertaking. 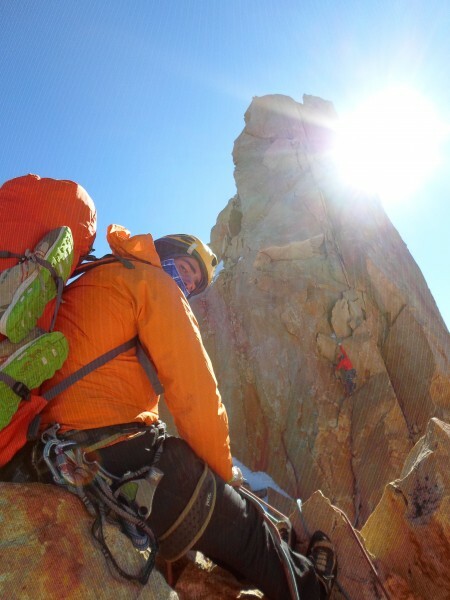 Iñaki, Cristóbal and Juan did a mixture between Steve's and Pedro's traverses, following Pedro's line to the summit of the Torre Sur, from where they descended the way they came, not descending to the south like Pedro. The short of it is that you can define a “traverse” whichever way you like, to each their own, but claiming the “first alpine traverse” is incorrect. 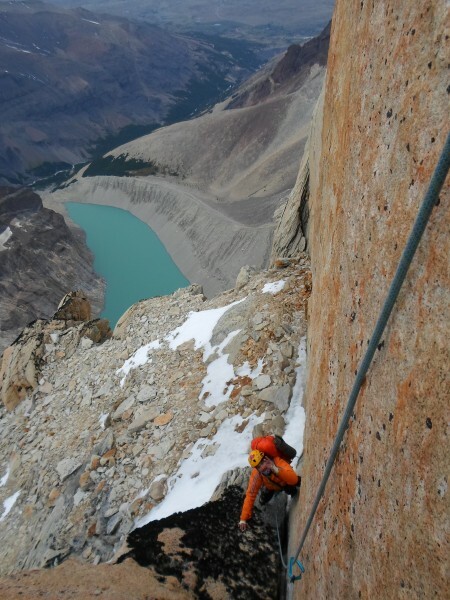 To understand better my gibberish above, here is a photo of Pedro's complete skyline traverse. Pedro Cifuentes ... was the first to do the "complete skyline traverse" ... in 2013, solo, in 29 days ... he descended south via the Hoth Route, a massive scary undertaking. Hello everyone! thank you very much for your comments about our publication the idea is just to share our climb and motivate new generations, not interega us to generate competition is an event we have experienced and seen in our last years of mountain climbing activities in Patagonia, this does not go with our private philosophy and style of climbing are just dreams and unforgettable viviencias with our fellow adventurers. On the other hand do not share their descent down the path Hoth, for our part we are interested in climbing and rappelling not be doing any wall, is much easier and safer to perform the same descent but make rappels down the valley of silence is the most logical even more so if you went on this side of the valley, I do not think it's real and safe to perform unprofessional decline Pedro but still pulling bags from anywhere, its history and ascension in a solitaire style with the help of porters and other I do not share, without diminishing the tremendous escalation and hard work I do but it's crazy !, thanks Peter for inspiring us make the crossing. Absolutely breathtaking! I can only dream of doing such a climb!! You did it in 56 hours? Amazing!